The next federal election is set by law for October 19, 2015. However the government has the option to call the election sooner and the political rumour mill is churning with that possibility. With the economy supposedly doing better, and after several years of austerity, and with an election looming, the 2015 budget should see some increased spending. Will that translate into a boost for Canada’s space program. Likely not, as it’s not a priority topic with the average Canadian, who for the most part, are unaware to what degree their daily lives are affected by Canada’s space program and assets. So as an election issue it has no traction. The Conservative government has been conservative with the Canadian space program. Base funding has been decreasing and only one national priority project is being funded to completion, the RADARSAT Constellation Mission. It seems unlikely the conservative government would change its position if it was re-elected. But what is a Liberal government was elected? While Liberal governments in the recent past haven’t exactly been generous towards Canada’s space program, they have invested more than the Conservatives. So would a Liberal government invest more in Canada’s space program than the Conservatives would? I believe they would and here’s why. Marc Garneau is the current Liberal MP for the riding of Westmount Ville-Marie, a strong Liberal riding, though Garneau barely won re-election with the NDP surge in the last election. Garneau, for those who you don’t know it, was part of the Canada’s first astronaut group, became the first Canadian in space and subsequently he became the President of the Canadian Space Agency (CSA). Prior to his space career he was in the Navy and retired as a Navy Captain. His background is in engineering and he received his engineering Doctorate in 1973. In 2012 ran for leadership of the party and was considered a strong candidate but he realized the tide of opinion was behind Justin Trudeau so he withdrew and threw his support behind Trudeau. Garneau is seen as highly intelligent capable MP and currently holds the positions of Liberal critic for Foreign Affairs, International Trade and la Francophonie. He previously served as House Leader and critic for Natural Resources. With Garneau’s intelligence, stature within the party and his support of Trudeau, it should come as no surprise that if a Liberal government was elected, and assuming Garneau wins his seat, not a given, then he would be well placed to have a senior cabinet position affording him a strong voice that Trudeau and other ministers would listen to. Having been in the military, an astronaut and head of the Canadian Space Agency provides Garneau a unique perspective that’s never been seen at the cabinet level in any Canadian government. There’s no doubt Trudeau would assign Garneau an important portfolio, perhaps Foreign Affairs or the Department of Defence but not likely Industry my sources tell me. If that’s the case, then Garneau wouldn’t have the Canadian Space Agency in his portfolio. But that wouldn’t matter. Canada’s space program is more than the CSA. The military has its space program and other departments such Fisheries and Oceans all have a toe-hold in Canada’s space program. What’s important here is that Garneau would be at the cabinet table and when matters of space are brought up it would make perfect sense to seek Garneau’s advice with his past experience and background. And that is how, in my opinion, in part, we might see a greater emphasis on the space program with a modest funding increase. But would we see any reforms? That’s a tougher question to answer. While Garneau would be the most visible Liberal in government with space experience, he might not be the only one. There are two other potential candidates who might be part of a Liberal government if they win their nomination and then win their riding. As rookie MP’s they likely won’t get a cabinet portfolio but their experience would be useful in any discussion about Canada’s space program. The first potential Liberal MP is Alain Berinstain who was the Director of Planetary Exploration and Space Astronomy at the Canadian Space Agency. 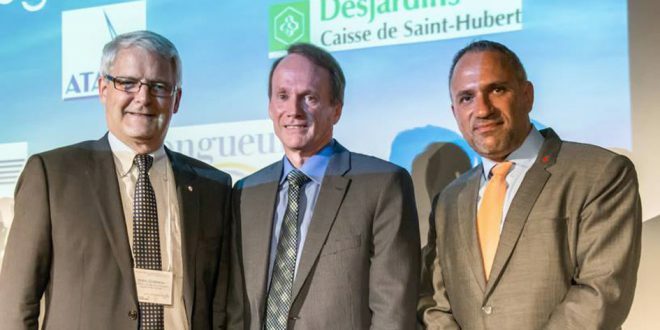 Berinstain is seeking the Liberal nomination in the Montreal riding of Dorval-Lachine-LaSalle a new riding created by the 2012 federal electoral boundaries redistribution. The current MP, of what was the riding of Notre-Dame-de-Gràce-Lachine, is Isabelle Morin (NDP) who came in on the NDP Quebec surge in the last election in what had been a staunch Liberal riding. I asked Berinstain by email his thoughts on the need to reform the Canadian Space Program. The other potential Liberal candidate with space experience is Ben Sanders. Sanders is an engineer and entrepreneur. He’s worked on the Canadarm and the Atlas detector at CERN. Sanders is seeking the Liberal nomination in the lone Yukon riding. The current MP is Conservative Ryan Leef another 1st time MP. The Yukon riding has seen representation from all parties since 1987. Does Canada’s Space Program Even Need Reforming? While the Conservative government never asked that specific question publicly it did initiate a review, the Aerospace Review in 2011, which subsequently released its findings in the Ermerson Report in late 2012. The report was named after its chair, the Honourable David Emerson. The Aerospace Review came about in part as the result of a previous failed effort by the government to create a Long-Term Space Plan. When former CSA President Steve McLean took the post in 2008 he was immediately tasked by the government to create a Long-Term Space Plan. He did so, but it was so distasteful, read expensive, that the government shelved it. The government explicitly recognize the importance of space technologies and capacity to national security, economic prosperity, and sustainable growth, and that the Minister of Industry bring 10-year, 5-year, and annual government-wide priorities for the Canadian Space Program to the Cabinet Committee on Priorities and Planning, which is chaired by the Prime Minister, for discussion and approval each spring. Current Outcome: On the civil side there has been little visible progress on this recommendation. In February the government released a very short Space Policy Framework document, but as discussed earlier while it was a step in the right direction it offered little in the way that was new. On the military side, the Defence Acquisition Guide was released last month. The government establish a Canadian Space Advisory Council, reporting to the Minister of Industry, with membership from industry, the research and academic communities, provinces and territories, and federal departments and agencies. A deputy minister-level Space Program Management Board be created to coordinate federal space activities, project-specific arrangements be put in place to ensure disciplined project management, and all agencies and departments with a role in the Canadian Space Program be required to report on how they are implementing priorities set out by Cabinet. Current Outcome: The deputy minister-level Space Program Management Board (DMGCS) was created in February and held its first meeting at that time. No information from that meeting was released including the names of those who make up the board. The Canadian Space Agency informed me only that “all departments across the federal Government with a vested interest in space are involved in this committee.” This includes the Canadian Space Agency, the Department of National Defence, Natural Resources Canada, Industry Canada, the Department of Fisheries and Oceans, Environment Canada and others. The Canadian Space Agency’s core funding be stabilized, in real dollar terms, for a 10-year period; major space projects and initiatives be funded from multiple sources, both within and beyond the federal government; and increased international cooperation be pursued as a way of sharing the costs and rewards of major space projects and initiatives. Current Outcome: In 1999 the CSA A-Base budget was set at $300 million. However since 2011 the CSA’s annual A-Base funding has been steadily declining. The 2014-2015 A-Base budget has now levelled off to $259,676,688. The government has stabilized the funding for the next three years. The A-Base budget for 2015-2016 is now set at $259,893,472 and for 2016-2017 it is currently set at $259,893,466. While A-Base funding has apparently stabilized it is still a whopping 13% less than the original A-Base level set in 1999. Taking into account inflation the actual drop in funding is significant. Of note, the government did fund one major project to completion, the RADARSAT Constellation Mission and this has had the result of increasing the CSA budget over the next several years which includes funds coming from other departments. These funds will then be distributed to the contractors including MDA who are building the satellites. If you compare how much Canada spends on its civil space budget as a percentage of our Gross Domestic Product (GDP) compared to our neighbours the U.S., you would find that we spend 75% less when compared to NASA. If you factor in other civil stakeholders like the National Oceanic and Atmospheric Administration (NOAA) that percentage increases. In other words Canada’s civil space budget as percent of our GDP when compared to our neighbours to the south is woefully low. As an exercise you could also compare what Canada spends as a percentage of its budget compared to the U.S. In that case, once again, only comparing the civil to civil programs, CSA to NASA, and not including other stakeholders, we find that Canada spends 70% less than the U.S. as a percentage. 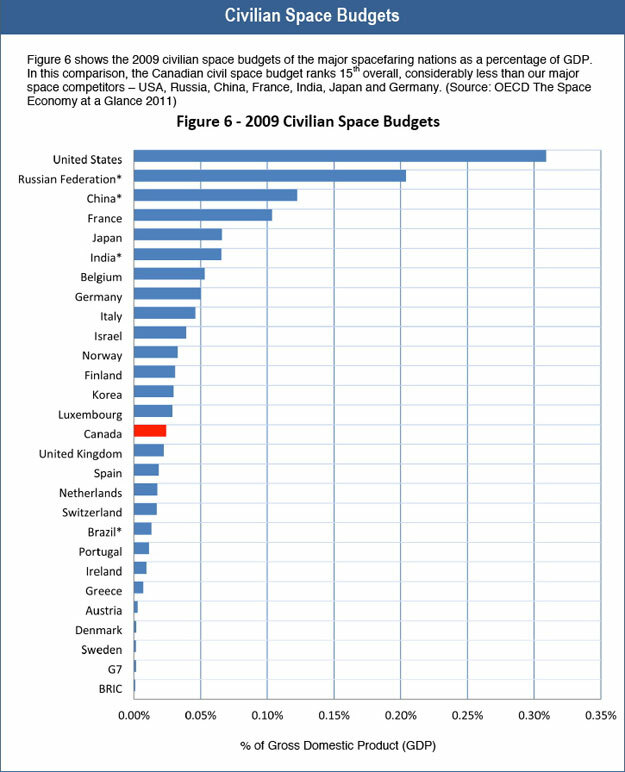 Canada spends less than 3/10th of 1 percent on its civil space program. Several nations with smaller GDP’s spend more as a percentage than Canada does on their space programs. India which has a comparable GDP to Canada spends more than three times as much and they have the capability to launch their own satellites. The following chart from the Organisation for Economic Co-operation and Development (OECD), though a few years old, does show civil budgets as percentage of GDP. Canada’s situation since this chart was released has gotten worse. The truth is Canada is falling behind in the civil space sector compared to other nations. Even our only two remaining active astronauts can’t get into space. Canada is out of credits for its work on the International Space Station (ISS). It’s projected by NASA that it won’t be until 2019-2020 before Canada would accumulate enough credits to send an astronaut to the ISS. Based on Canada’s needs, based on what other space faring nations spend as a percentage of their GDP, it would appear that Canada’s civil space budget should be in the neighbourhood of $1.6 billion annually. However don’t expect that to happen anytime soon even should a Liberal government be elected. Current Outcome: The government’s response on this is as follows “The approach to space procurements will align with the broader government review of defence procurement in response to Tom Jenkins’ report to support economic opportunities for Canadians as announced in Budget 2013. Once this overall approach to procurement is in place, the Government will seek to ensure that space asset and service procurements are consistent with it.” So we should expect something along the lines of the recently published Defence Acquisition Guide. Current Outcome: The government’s response on this is as follows “The CSA will double its Space Technologies Development Program budget to reach $20 million annually by 2015-16. This will provide greater predictability in funding for industry and support industrial capacity building through the development of new products, services, processes as well as know-how.” On June 2nd, the CSA release an Announcement of Opportunity with $10 million available as part of the Space Technology Development Program. Current Outcome: The government’s response on this is as follows: “The Government of Canada is taking steps to provide opportunities for the space industry to grow through trade promotion, such as the Canada-European Union trade agreement, and workforce and skills development measures.” Trade promotion has already been in place for some time. As well, Canada has a long-standing relationship with the European Space Agency (ESA) as the only nation outside of Europe that is an associate member. Canadian companies can already do business with ESA. Would a free trade agreement with Europe make it easier for Canadian companies to work with their European counterparts? Yes. Overall though there doesn’t appear to be much progress on this item. So six years after the initial attempt of creating a Long-Term Space Plan and a year and half after the Aerospace Review we have a space program which has seen its base funding decline, structural changes made that will take time to evaluate and still no Long-Term Space Plan. New Canadian Space Agency President General (Retired) Walter Natynczyk is working on a new Long-Term Space Plan but it remains to be seen when or if it will be released. This approach may just be a reinterpretation of what the CSA should have been doing all along. I say this because the Canadian Space Agency Act specifically states that one of its functions is: “In carrying out its objects, the Agency shall assist the Minister to coordinate the space policies and programs of the Government of Canada;” (Section 5, Item 2a). But there’s a bigger point here. As discussed previously in Space Quarterly Magazine, the founders of the Canadian Space Agency wanted the Agency to be an independent Agency, not an Agency under another portfolio, as it is now under the Industry Ministry. If the CSA is going to implement the governments “Whole of Government Approach” then maybe it’s time to rethink the Agency’s position within government as a whole. Canada’s fundamental well being includes the security of our borders, the monitoring of our environment for resource utilization, disaster management, weather forecasting, telecommunication, commerce etc. All of these items rely heavily on Canada’s space assets every single day. They are critical to Canada. It is therefore incumbent on our politicians to realize that a bigger structural change needs to be made with respect to Canada’s space program. Perhaps it is time that our space program be removed from the Industry portfolio and be made into an independent Agency. In 1958 the U.S. government did just that when it consolidated NACA and other assets to create NASA as an independent Agency. Michael M. Atkinson, William D. Coleman, Obstacles to organizational change: the creation of the Canadian Space Agency (1.6MB PDF), Canadian Public Administration / Administration Publique du Canada, Volume 36, NO. 2 (Summer/Ete), pp. 129-152. Next Satellite sees Smoke from Canadian Fires over U.S.